For these meatballs, I borrowed the idea of adding pignoli (pine nuts) and golden raisins from my grandfather’s Pork Braciole. They’re the best meatballs in the world. Traditionally, Italian meatballs are cooked in red sauce. If I happen to be making both these and red sauce at the same time, I might throw the meatballs into the sauce, but they don’t need it. They’re so flavorful that I like to bake them and eat them straight from the oven. They’re always the first thing done when I’m cooking a big meal, so I snack on them. With leftovers, I make a sandwich with nothing but crusty bread, meatballs, and additional provolone. 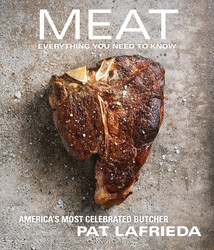 From Meat: Everything You Needed to Know. 1. Preheat the oven to 350°F. Line a baking sheet with parchment paper or foil. 2. In a medium skillet, toast the pine nuts over medium heat, shaking the pan often, until golden brown all over, 4 to 5 minutes. Transfer the pine nuts to a plate so they don’t continue cooking, and set them aside to cool to room temperature. 3. Put the pork in a large bowl. Add the pine nuts, raisins, breadcrumbs, pecorino, provolone, parsley, eggs, garlic, salt, and pepper. Gently work the ingredients together with your fingertips. Don’t overwork the meat or press it together, or your meatballs will be tough and heavy. Roll the meat into 36 balls (about 2½ ounces each, a little bigger than golf balls). 4. 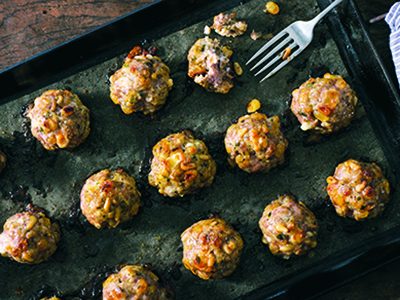 Lay the meatballs in a single layer on a baking sheet and bake them until they are cooked through, about 20 minutes. Let the meatballs cool slightly before removing them from the pan.